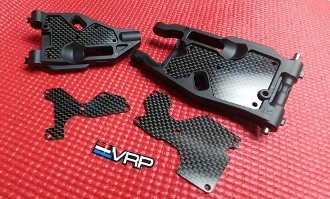 VRP has just released Carbon Arm Inserts for the newly released Mugen MBX8. The inserts will be available in .8mm, 1mm and 1.2mm thicknesses and sold in pairs of (2). These can be used in place of the plastic inserts to take away flex and stiffen the arm. This can be a good adjustment for smoother, high grip tracks.